I have never paid a penny in credit card interest, in fact I have even used cards to increase my savings by taking advantage of interest free periods and linked high interest savings accounts. I have no personal issues with them as an aid to budgeting. But this doesn't mean that I'd don't think they are very dangerous. We all know how easy it can be to get caught in the "minimum payment" trap, and how many people do so. 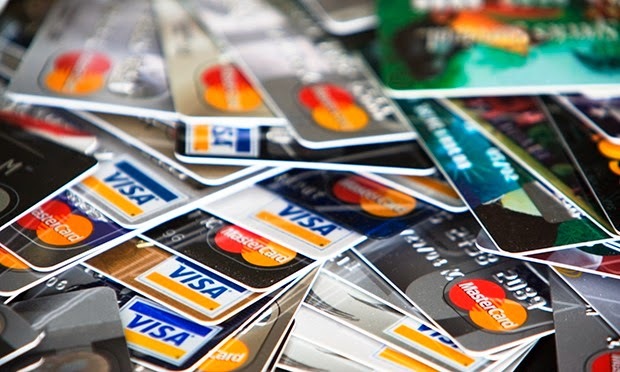 TOTAL CREDIT CARD DEBT IN NOVEMBER 2014 WAS £61.0BN. PER HOUSEHOLD THIS IS £2,308 – FOR A CREDIT CARD BEARING THE AVERAGE INTEREST, IT WOULD TAKE 25 YEARS AND 4 MONTHS TO REPAY IF YOU MADE ONLY THE MINIMUM REPAYMENT EACH MONTH. THE MINIMUM REPAYMENT IN THE FIRST MONTH WOULD BE £55, BUT REDUCES EACH MONTH. IF YOU PAID £55 EVERYMONTH, THE DEBT WOULD BE CLEARED IN AROUND 5 YEARS AND 5 MONTHS. The problem is made much worse by the fact that people who should not be given credit are routinely allowed to take out several cards in the full expectation that they will not pay off the debt and will be caught in this trap. Personal responsibility is one thing, and of course it's relevant here, but surely the financial sector should be more highly regulated. This much personal debt can't be good for the economic (or psychological) health of the nation. The other side of the coin is the fact that having no credit record can be a real problem and the easiest way to get one is to get yourself a credit card. People who worry that they will not be able to manage a card and that they will be tempted to overspend have to work round this, or give in and get one. I have had reason to think about these things recently because someone close to me has just revealed that they have a very large credit card debt that they can see no way of paying. The all round worry and distress that this is causing (and has been causing for some time) makes me very angry because it isn't debt built up buying expensive holidays and meals out. It's debt built up due to a low income combined with very high energy bills and the fact that living just a little over income has been turned into a big debt by interest-greedy card companies. I know that debt like this doesn't happen unless someone isn't in control of their budget (as we all should be) but personal failings in this area should not be allowed to become someone else's (large) profit margins. It simply isn't an ethical business model. I am working towards a retirement "Number" that is based on what we spend now (minus savings and pension payments) which works out at £2380 per month. The credit card bills currently make up between 40% and 70% of that figure. It varies so much because we use them for holiday payments etc. I have stuck a pin in a number somewhere in the middle and assessed what we are spending as £1450 on "average". But I'm not even tracking this so how can I know? There's a big gap in my budgeting here that I need to address. Yet another spreadsheet I'm afraid. But, in the light of recent experience, credit card spending is one area that definitely needs constant care, control and containment. I was handed my first credit card when I opened my student bank account at 18. However, it wasn't til I was in my 20s and 30s that I got more cards when my limits maxed and just paid off minimum amounts. It was only when 0% credit cards became available that I was finally able to start paying off the debt in larger chunks but even then, I didn't really change my lifestyle and spending or I would have paid it off quicker. The figures you've posted are scary but I think also just the tip of the iceberg, as I'm sure there will be many people (like the person close to you) who are hiding the debt from public and from their loved ones. Perhaps people of a certain level of income should only be allowed to take out one credit card, up to a certain limit. I can't believe that such a system couldn't easily be put into place as nearly all banks would use the same credit check reference agencies to see who has applied for what. Good luck with your new credit card spending spreadsheet! Wow, those are some sobering statistics at the start of your post! And to think that is actually the average, and many without any CC debt, there must be some absolutely mountainous piles of credit card debt in the upper percentiles of the stats!!! Scary stuff. Hi TFS, you've reminded me that it might be useful to look at swopping one of our cards for something that gives better cashback. It's a Halifax Mastercard and we get hardly any cashback as none of the "offers" ever seem to coincide with where we shop. However, we do get some cashback on a Santander one which we use for groceries and petrol and I have an M&S one which is great for collecting points. Both these two have fairly low levels of credit so I also have a MBNA card which doesn't actually give me any type of perk so it might be time to look at that one too. And yes, you're right - they're all paid off in full each month. I've set up the spreadsheet and will be interested to see how things pan out. Hopefully having to keep it up to date will be enough to make me think twice about what I'm spending.